When did you first start offering The Hollyhock House as a wedding venue? We’re in our ninth season this summer. I think it's safe to say we're quite experienced now! 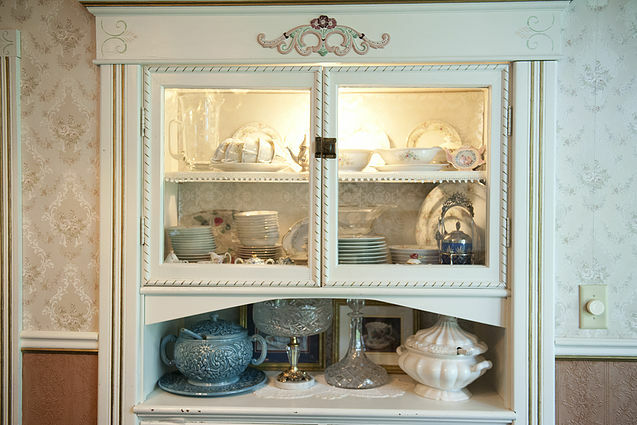 What inspired the theme for the house and gardens? The gardens were already in place when we purchased The Hollyhock House, but we added the whimsy and charm that have enhanced the appeal of the property. What is the history of The Hollyhock House? The house was built by Frank Hruska in 1912. His only daughter Annie continued to live in the house her entire life. However, Annie was a bit of an eccentric who, among other things, kept her goats in the house in the winter. Needless to say, the house eventually fell into rack and ruin. But then in the late 1980’s a young couple in Kewaunee bought the house and, in my opinion, by divine inspiration decided to renovate and remodel the house and turned it in to the charming Queen Anne Victorian cottage that you see today. Despite its new look, folks in Kewaunee still referred to it as “the goat house.” When we bought the house, we decided to name it The Hollyhock House because we were inspired by the romantic hollyhock flowers already in the gardens. How many weddings do you typically book each year? We limit it to ten to twelve weddings per season because not only is the Hollyhock House my family's personal vacation home, but we are able to keep the gardens in better shape when there are fewer events held here. What is available for venue rental options? 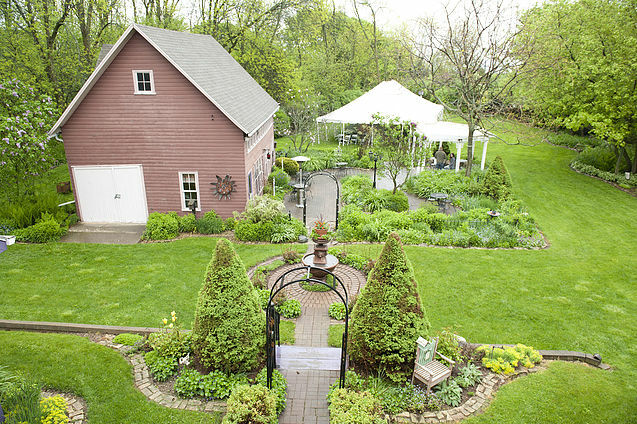 We offer a number of unique packages that can include not just the use of the gardens for your ceremony or reception (or both), but the house for lodging as well. Additionally, we offer multi-day packages allowing you to turn your special day into a destination wedding weekend. How many people can The Hollyhock House accommodate for lodging, ceremonies, and receptions? 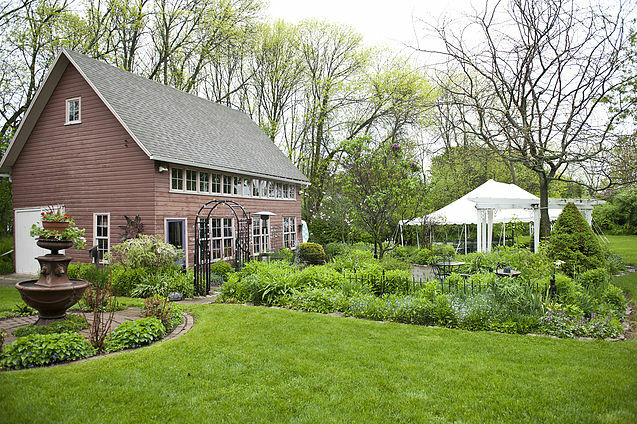 For the ceremony or reception, the gardens will accommodate around 150 people. There are beds in the house sufficient for sleeping around six individuals. Our clients most often choose to have the bride stay in the house on Friday evening with some of her bridesmaids where they enjoy a “girls night” (the third floor’s dormitory-style set-up is perfect for this) and then she kicks them out on Saturday night so that she and the groom can enjoy their own private get-away. 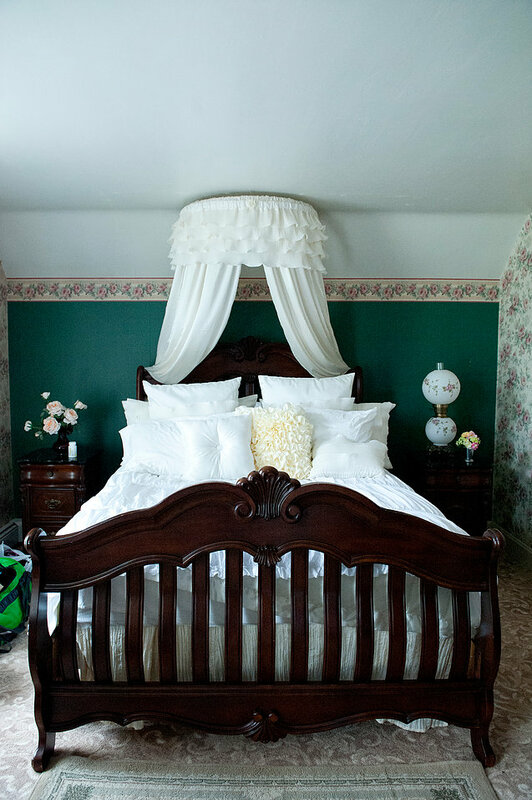 Wait ‘til you see the bridal suite – sooooooo romantic! Do you have a list of vendors couples are required to use? We don’t require that couples use any particular vendors, but we certainly can recommend some. We have a complete “Vendor Resources List” that we provide to each of our couples which includes information on all local wedding-service resources. We've worked with these vendors in the past, and it's a great tool for our clients to streamline their wedding planning. Is there electricity available for outdoor ceremonies and receptions? We’ve re-wired the entire garden to make electricity available throughout the garden! When can couples start setting up for their wedding? That depends on which package a couple has chosen. But since we’re a private venue, we can be pretty flexible about that. Do you book more than one wedding in a day? Absolutely not! If you choose The Hollyhock House as your wedding venue, the place is yours and yours alone for as long as you choose to use it. This is a privacy guarantee that no public garden venue can offer. Is there an indoor option for receptions? Absolutely . . . but not on our grounds. A terrific option is Lake Haven Hall in downtown Kewaunee situated directly on the lakefront. 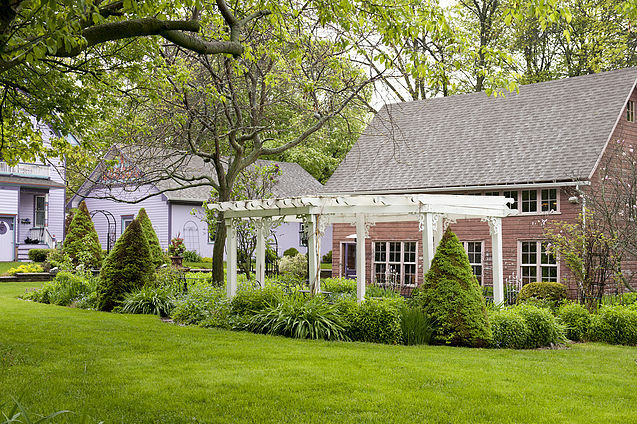 If you decide to have your ceremony in our garden but prefer an indoor venue for your reception (recommended for receptions of 150+), we can put you in touch with the appropriate persons to make your reception arrangements at Lake Haven Hall. How far ahead do you accept deposits? As far ahead as couples wish to reserve their date. A $200 deposit will hold the date for a period of 60-days. At the conclusion of the 60-days we ask the couple to sign our Event Contract, and their deposit will go toward their package cost, otherwise we release the date at which time we’ll return the deposit. Where can couples find your pricing? Our current pricing is on our website at www.thehollyhockhouse.com. Just go to the PRICING tab across the top of the page, enter an email address and download the pricing. If there are any questions at all, couples can me an email at karen@thehollyhockhouse.com. What types of flowers are in the gardens? Well, that depends. What’s blooming changes by the day, week and month. 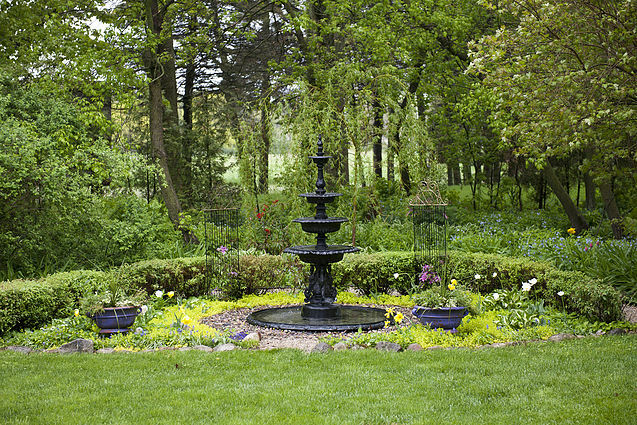 This is a true English-style garden, which means that a wide variety of plants grow in the garden. The stars of our garden are the roses, but that’s only a fraction of what’s there. The important thing is, something is ALWAYS blooming, even into October. But like all good Midwestern gardens, once the frost comes, our garden sleeps until Spring. What is your favorite wedding that was held at The Hollyhock House so far? We really like it when our clients “get” what we’re all about and they utilize all that we have to offer. Our favorite weddings have been those where the bride and groom have chosen the full weekend package. It allows them to utilize the gardens on Friday night for their rehearsal and rehearsal dinner, build a fire in the outdoor fireplace, and kick back for a fun and relaxing evening with family and friends the night before the BIG event. What do you see for the future of The Hollyhock House? Hm, that’s an interesting question. We’ve always attempted to stay abreast of what’s going on in the industry so that we can offer our clients the best venue of its kind in the area and, as a result, our services have improved and evolved over the last eight seasons. We plan to continue to keep an eye on future trends – and incorporate them into our offering as best we can so that we remain competitive and relevant. I can say from personal experience that it has been such a pleasure working with Karen and The Hollyhock House so far in our Kewaunee wedding planning. Tyler and I can't wait to have our wedding weekend there next September. Thank you to Karen for all of her help so far and for taking the time to answer our questions for all our curious brides out there.